Purple is my favorite color, so it is no wonder that I gravitated towards the purple scalloped eyelet Lucille dress from J.Crew. I love this particular shade of purple as it is electric, bright and vibrant! After showing this post to my husband he argued that the dress is blue and not purple. Technically the color as dictated by J. Crew is "Brilliant Purple." That's what it says on the tag. Would J. Crew lie to me? I would hope not after our long relationship together! I do understand that the dress has blue undertones and the pictures make it look more blue than purple, but to me it is purple IRL. Well, regardless of where you stand on this heated debate, the dress was a great deal. I was able to find it on sale a few months ago at my local J.Crew. If my memory is correct, I believe I paid a mere $59 for it. I know it is a lot of color, but I decided to pair the dress with a bright pink belt. Who doesn't love color? 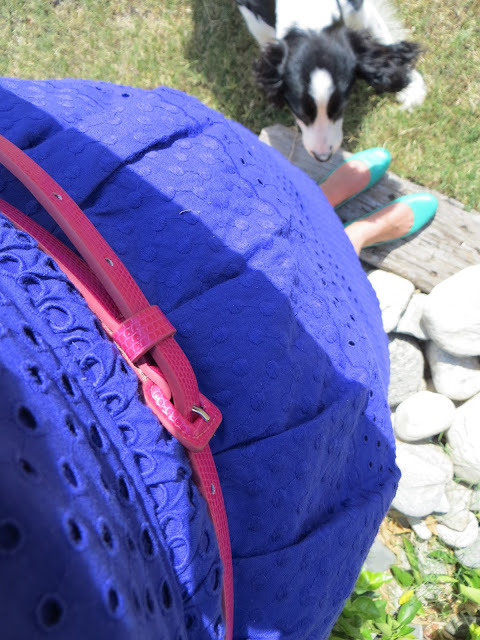 The belt is from one of my other favorite stores, Target. You have to admit, Target has some great stuff. For example, Target has many really cute belts which can be had for under $15. I think I paid about $8 for this one, another great deal! I also wanted to add a pop of color with my shoes. These are my Cece ballet flats in Gallery Green. I love this turquoise color as it compliments so many things. I took this picture of my shoes myself as I thought it might look "cool" and "artistic." Normally my husband takes the photos, but I thought I would take matters into my own hands this time. During one of the shots William bombed the photo, however I thought it turned out sort of cute! To go along with my recent art history tangent, I thought I would also include a piece of art which compliments my outfit today. 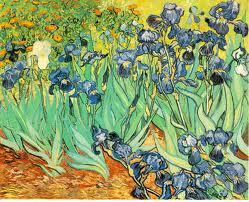 The work is Vincent Van Gogh's Irises. Again, I love the use of colors in this particular painting. I think I was subconsciously influenced by it when selecting this particular outfit! 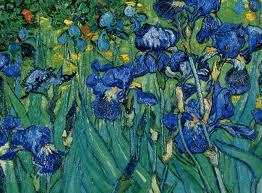 I wonder if Van Gogh thought these Irises where more blue or purple?